While the only time you may enter your attic is to put away your holiday decorations, maintaining good indoor air quality in your attic is important for the overall health of your home, especially if your central air or heat system is located in the attic. Wood, which is the dominant substrate in attics, is the perfect food source for mold. Add a moisture source, which can result from improper ventilation, over-insulating, roof leaks or exhaust fans venting directly in to attics and unhealthy mold can begin to grow. 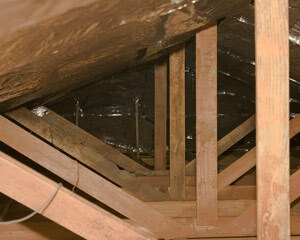 Do You Need Mold Remediation in Your Attic? If you've have mold testing done in your attic to confirm that there is in fact a mold issue, or if you are seeing a mold-like growth or black mold on the underside of your roof, contact us to speak to with a professional about having a mold remediation done in your attic. Click Here to download a FREE brochure of Tips on Preventing Growth Mold in the Attics..